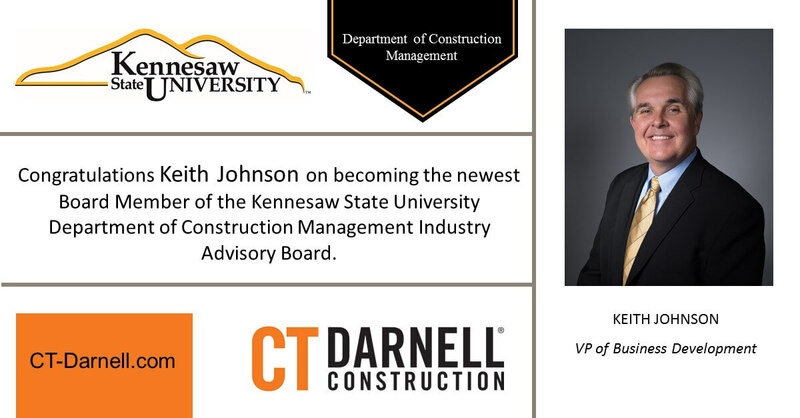 CT Darnell is proud to announce that our VP of Business Development, Keith Johnson, has been elected to the Industry Advisory Board of Kennesaw State University’s Department of Construction Management. The primary objective of the Board is to ensure the department’s programs and standards adequately prepare graduates to meet or exceed the needs of employers in the construction industry. Construction education is also highly valued at CT Darnell. Our internship programs provide invaluable work and learning experiences to students, and we welcome the opportunity to have a hand in training the construction industry’s workforce and future leaders. Two of our current interns are KSU students who are pursuing careers in Construction Management. Keith, himself, is an alum of KSU, where he earned his MBA. He also earned a BS in Industrial Engineering from Southern College of Technology, which, in 2013, became part of KSU. Kennesaw State is the third largest university in Georgia and one of the 50 largest public universities in the nation, with over 35,000 students. It offers more than 150 undergraduate, master, and doctoral degree programs at its Kennesaw and Marietta campuses, in metro Atlanta. The College of Architecture and Construction Management is located on the Marietta campus. KSU’s Construction Management Bachelor of Science program offers six areas of specialization: General Contracting, Land Development, Electrical and Mechanical Construction, Heavy Civil or Highway Construction, Residential Construction, and Facility Management. Students can also pursue a Master of Science in Construction Management; both the BS and MS programs are accredited by the American Council of Construction Education.